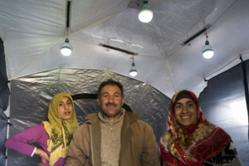 A Turkish family finds relief in their ShelterBox insulated tent, lighted by Nokero solar light bulbs. Nokero solar light bulbs are among the lifesaving items being delivered as part of the ShelterBox disaster relief effort under way in Van, Turkey. It's the latest mark of a greater trend toward using renewable energy to alleviate suffering in the wake of natural disaster. Millions were left without power when Turkey was struck by a magnitude 7.1 earthquake Oct. 23. Two weeks later a magnitude 5.6 earthquake struck the same region, near the city of Van. Nokero solar light bulbs are giving earthquake victims a robust and renewable source of light in the devastated area, where candles and flashlights are scarce. Each bulb brings hours of light every night for about a year and a half before its AA rechargeable battery must be replaced. Five Nokero solar light bulbs, which can be charged by the sun during the day and provide hours of light per night, are part of each relief kit being deployed in the area by ShelterBox, the internationally-renowned disaster relief organization. A ShelterBox Response Team (SRT) was on the ground delivering insulated tents, Nokero solar light bulbs, and other lifesaving supplies to earthquake victims when the magnitude 5.6 aftershock struck. Listen to a personal account of the moment the earthquake struck here. ShelterBox is an international disaster relief agency that provides emergency shelter and lifesaving supplies for families around the world who are affected by disasters at a time when they need it the most. Nokero develops safe, affordable and environmentally-friendly solar technology that provides relief during disaster and eliminates the need for harmful and polluting fuels commonly used for light and phone charging around the world.